A home inspection is a non-invasive examination of a piece of property. We do not drill holes in walls, tear up carpeting or cause any damage to the home being inspected. Our inspection is performed in areas of the home you may not necessarily have access to or wish to visit such as attics, basements, crawl spaces and other hidden areas. We look for clues and signs of any potential issues that may not be visible to the average buyer, and use specialized equipment, such as moisture meters and infrared, to allow us to gather information that cannot be seen, heard or smelled during a simple walkthrough. If you are purchasing a property, the answer is yes. A pre-purchase inspection allows you to make sure that you’re getting what you’re paying for. Selling homeowners may omit or not be aware of pertinent information that could result in thousands of dollars of repairs resulting from costly issues that you were not made aware of. When you’re spending hundreds of thousands of dollars on a home, a home inspection is a small price to pay for ensuring that your investment is worth it. What does an inspector inspect? An inspector follows a thorough checklist to evaluate all the important parts of a property and the land immediately surrounding it. In addition to reporting on the condition of the structure (roof, walls, foundation, etc.) , we examine drainage, plumbing, electrical, heating and air systems, and windows and doors. We will go into attics, crawl spaces, basements and other hidden spaces (when accessible). In addition to faulty structural problems, we may discover pest or insect problems, water damage, or potential health hazards from improperly operating ventilation systems. I personally inspect more than 450 properties every year. My level of expertise allows me to gather information and assemble clues that the average home buyer would never notice. I know exactly where to look for crucial clues that may expose an underlying problem. What may look “normal” to you, could be an important indicator to me that there is a hidden issue. I not only see flaws and potential problems, I’m aware of the different systems that make up a home, how they work in conjunction with each other and how one problem could potentially cause a domino effect of problems in other areas of a home. When purchasing a home, you may be excited about the idea of your new home, making it difficult for you to remain completely objective in your assessment, especially if it means that you may suffer great disappointment. What happens if the home fails an inspection? The inspector’s report gives you the opportunity to make an informed choice. So if the report is clean, then I didn’t really need an inspection? This is not the case. The inspection provides you with insight into the health and stability of the property you’re purchasing. A clean report will give you peace of mind that you have little or nothing to worry about regarding your new investment. It allows you to get on with the process of moving in and adjusting to your new home without worrying or wondering what you really purchased. Yes and no. Ontario laws are changing. 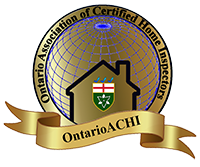 Although there is regulation for certified home inspectors, not all home inspectors are required to be certified. There are several “official” inspection associations, but no mandatory regulatory board. We work for you and you only and keep only your interest in mind when performing an inspection! If you have questions or concerns about a new or existing home give us a call or contact us to schedule an appointment.